Rule "Performance counter registry hive consistency check" failed. The performance counter registry hive is corrupted. This may mean that the value in HKEY_LOCAL_MACHINE\SOFTWARE\Microsoft\Windows NT\CurrentVersion\Perflib under Last Counter and the last number value in Counter under HKEY_LOCAL_MACHINE\SOFTWARE\Microsoft\Windows NT\CurrentVersion\Perflib\009 are not the same. The same also for Last Help and Help. This fix only applies if HKEY_LOCAL_MACHINE\SOFTWARE\Microsoft\Windows NT\CurrentVersion\Perflib\009 has no values and you can not add any. 009 is the English Locale ID. You may have this problem with another locale where you have no values and cannot add any either. The same fix will apply. I am trying to install on a virtual differencing disk that I have run NewSID against. I found myself in the Microsoft Forums (see reference #5), but no one had figured out how to fix my particular problem. One person came close but wasn't quite there. So I started searching for how to fix my performance counter problem. Isn't it awesome that things that you don't really care about sometimes become issues with things you do?! I found the solution and I wanted to share. I found that I had disabled performance counters and to have the Counter and Help registry values, I only needed to fix that and reload all of my counters. 5. Try your install again. 6. If that doesn't work, you need to perform an in-place upgrade of Windows (see reference #4). Then follow the instructions above to rebuild the performance counters. You will also need to re-install all service packs for Windows after you do this. The good news is that you don't lose your applications at all. 7. Once you have completed this, try to install the application you were originally trying to install. In my case this is the monolithic SQL Server 2008. 2. http://support.microsoft.com/kb/888017 - Expanding a file off of the installation disk. 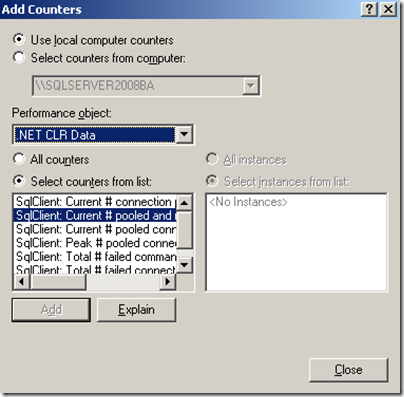 5. http://forums.microsoft.com/TechNet/ShowPost.aspx?PostID=3231101&SiteID=17 - Re: How to resolve "Performance counter registry hive consistency check" failed? http://blogs.msdn.com/astebner/archive/2004/08/13/214220.aspx - A fix that didn't work for me. Unable to read the performance counter strings of the 009 language ID. The Win32 status returned by the call is the first DWORD in Data section. THE CATCH that sunk me is that when opening Command Prompt you MUST right-click and "Run as Administrator"!!!! If you don't, you will get "Error: Unable to rebuild performance counter setting from system backup store, error code is 5"
I live with GLINT - I am an old shop hack and need to see my counters - dead now since trying to "upgrade" to winxp SP3 - I've tried their directions in the past, gave up, went to ERUNT to simply restore a registry from when it worked. Well, one thing, "lodctr /R" fails on winxp pro - it seems to require an argument. Geesh.. I guess I'll try another couple of times (takes forever with reboots and all) then give up, hope that SP3 didn't do too much damage, go back to a working registry and redo the last 5 days of "simply" putting in SP3 -- again.... ARG!! Joe B-- Just a thought: Did you try "System Restore" to take your machine back to a prior "Restore Point"? @Joe B: I had to go look up GLINT (http://www.scitechconcept.com/glint.html). That or ERUNT (http://www.larshederer.homepage.t-online.de/erunt/). Those look like some interesting tools I will have to check out! @Kevin: Thanks for the original catch on Windows Vista! built them back in a couple of minutes. Thanks, step 2 worked for me. Thank you million times. You saved me from a lot of trouble. Thanks, my installation of Autodesk Inventor was getting hung up because of this one issue, but simply opening CMD and typing lodctr /R fixed everything. Amazing, absolutely amazing. Rule “Performance counter registry hive consistency” failed. The performance counter registry hive is corrupted. To continue, you must repair the performance counter registry hive. For more information, see http://support.microsoft.com/kb/300956. This issue can be easily fixed by type the following command in Command Prompt window. Its work for me on Xp. Thank you Panneer. You will notice that the link you gave me was already in my post. while this pushed me in the right direction for me it did not work. I work on an dutch XP SP3 machine and could not get the management studio working. I used the REGMON tool to see what hive it looked for in the registry and discovered it missed the 013 folder under PERFLIB not 009. All i did was copy the keys and values under 009 to 013 and it worked. "009 is the English Locale ID. You may have this problem with another locale where you have no values and cannot add any either. The same fix will apply"
I had worked through every web fix I could find on this, (including http://support.microsoft.com/kb/300956) and they were all missing the small point that you noticed- the 'disable performance counters' being set to 1 in the registry! 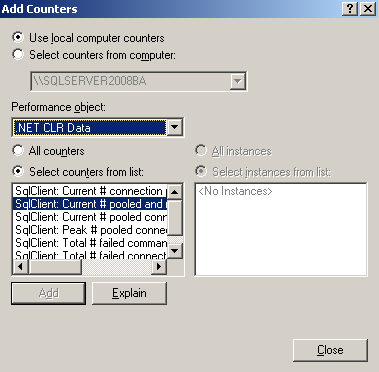 Changed to a '0', rand lodctr /R and then re-attempted SQL2008 setup and voila!